Our article on the Hôpital Laënnec drew tremendous response, mostly aghast, at the news of the fate awaiting this religious building which is almost four hundred years old and an important landmark for both Parisian history and more specifically, art history. Two readers expressed doubts about whether the chapel was part of the public domain and the Assistance Publique’s obligation to obtain its secularization via a decree from the Préfecture before removing it from the registry of protected buildings. Unfortunately, some cases are very ambiguous as the law does not clearly define the notion of public and private domains with final decisions often made based on jurisprudence, that is precedent or statue law. Readers of The Art Tribune may recall the scandal of the Henri Martin paintings sold by the Béziers Chamber of Commerce, an ensemble which was specifically created for the offices of that public establishment (see the articles in French). At the time, no one was able to state clearly if the works were “inalienable” or not (cannot be sold because they are part of the public domain). 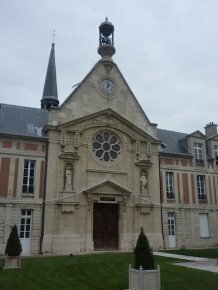 In our opinion, shared by the barrister president de La Bretesche, the chapel did indeed belong to the public domain of the Laënnec hospital. And no one can claim that before transforming a chapel into a meeting room it need not be secularized, something which never happened here, with or without a decree from the Prefecture. The French Republic is a lay state but to our knowledge, it has always protected places of worship, indiscriminately. We should add that the specifications for the new project, accepted by the buyer clearly reflected the archbishop’s wish that the chapel remain as a place of worship. Finally, it is also extremely doubtful whether the tombs housed there can be relinquished. But is this simply a legal question ? Why do companies such as Cogédim and Allianz, public officials, the Assistance Publique not understand that this is above all a matter of principle and therefore a moral issue ? Why would anyone choose to deprive Paris of one of its heritage landmarks for the sake of making more money ? Why does the public, as responsible citizens, allow this scandal to happen ? Speaking of moral issues may seem old-fashioned. And yet this is what it is all about. But since it would seem there is no point in hoping for a bit of high-mindedness from people who only think in terms of financial gain, at some point we will need to pass a law which will set down strict guidelines and obligations if we wish to really protect that sector of the public domain which does not belong to museums. At the moment, incredible as this may seem, art objects which are not registered or listed as historical monuments, thus supposedly “inalienable” since they belong to the public domain of an establishment, suddenly become “alienable” (can be put up for sale or trade) when said institution is declassified, that is goes from the public to the private domain, and according to a very easily obtained procedure which generally depends only on the seller. The obligation of keeping protected religious buildings which were historical monuments but then sold to private entities open to the public, whether or not they continue to be used as a place of worship. Immediate and unconditional listing under the public domain  of all art objects which are over one hundred years old belonging to a community or a public establishment. Complete and irreversible (except, perhaps, according to the same criteria applied to objects belonging to museums) “inalienability” of all art objects over one hundred years old belonging to the public domain, regardless of the owner. The possibility of listing furniture ensembles as a whole, that is, so that the individual pieces cannot be separated ; this could have been the case, for example, for the furniture of the chapel at the Hôpital Laënnec which had been commissioned specifically for the building. The possibility of assigning certain objects or ensembles which are protected as historical monuments to permanent residence in the place where they are held ; here again, this could have been the case for the works held in the chapel at the Hôpital Laënnec. The national parliament has not studied a law for protection of heritage for many years now, one that would defend it from continuously increasing pressure. In fact, the trend seems to be the exact opposite. There is no question that such a law would require careful reflection. This is a battle which is well worth fighting and we invite our readers to share their remarks and suggestions with us here. It would be a feather in the cap of the Ministry of Culture to take up the cause, thus allowing it perhaps, for once, to take the initiative in what is in fact its expressed role : defending our national heritage. We are not referring here to listing as a historical monument, but rather the acknowledgement that they belong to the public domain. Next article in Editorial : Korean manuscripts : the end of inalienability ?